Sanders researches and teaches the history of environment, Pacific Northwest and American West, and modern US. Sanders is currently working on a book titled Childhood and Environment in the Postwar American West (forthcoming, Cambridge University Press, 2016). 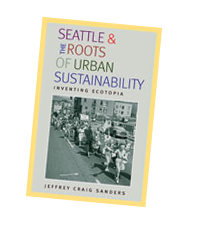 Sanders’s recent publications include, Seattle and the Roots of Urban Sustainability: Inventing Ecotopia (August, 2010), published as part of the History of the Urban Environment series with University of Pittsburgh Press; “Animal Trouble and Urban Anxiety: Human-Animal Interaction in Post-Earth Day Seattle,” Environmental History (April 2011); “Building an ‘Urban Homestead’: Survival, Self-Sufficiency, and Nature in Seattle, 1970-1980” in Green Openings: Urban Landscapes in Twentieth Century History (University of Virginia Press, 2011), published in conjunction with the German Historical Institute; “Madonna on the Road,” in City Dreams, Country Schemes (Reno: University of Nevada Press, 2011) ; and “The Battle for Fort Lawton: Competing Environmental Claims in Postwar Seattle,” Pacific Historical Review (May 2008). His public history work includes Atomic West/Atomic World a National Endowment for the Humanities Landmarks of American History grant focused on the Hanford B-Reactor (July 2014) and the book McClellan Park: The Life and Death of an Urban Green Space (Albuquerque: Albuquerque Museum Press, 2004).